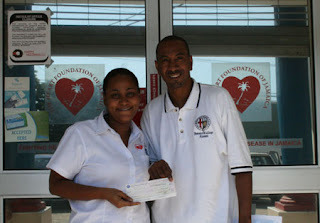 On Thursday November 19, 2009, at the offices of the Heart Foundation of Jamaica (HFJ), Jamaicans.com owner, Xavier Murphy , presented a check for J$ 41,050 (US $500) to assist the Foundation in its fight against heart disease in Jamaica. The donation was made possible through the generosity of the Jamaicans.com site visitors & members who donated to the annual Heart Foundation of Jamaica drive. Mr. Paul Thompson, Medical Manager at the Foundation said, “With the rapid increase in the demand for our services and the coherent growth in our facilities and offerings, there has been an ever-increasing need for us to acquire additional equipment. This donation will go a far way in helping the Foundation to do so and in turn, increase the number of persons we are capable of screening island-wide.” The HFJ was established over 38 years ago and screened over 64,000 persons who visited its premises at 30 Beechwood Avenue in 2006 alone. The main objective of the Foundation is to reduce the incidence of death from heart disease in Jamaica, while educating and screening the nation on cardiovascular diseases and its prevention. The Heart Foundation of Jamaica has been the recipient of donations from the Florida based website, Jamaicans.com for the past 6 years. The donation is made in the memory of Marcia "Ackeegirl" Davidson. A true Jamaican, Marcia was instrumental to the Jamaicans.com website, she was the first moderator and administrator and was active in many other areas. After her death in July 2003 from a long fight with heart disease, the site vowed to make an annual donation to The Heart Foundation of Jamaica in honour of her memory. Jamaicans.com was launched in December 1995 and now houses the largest online Jamaican community boasting 30,000 registered users and over 1.8 million "impressions" per month. Ranked as the No. 1 Website on Jamaica for four years (Source: www.top5jamaica.com). The site provides a forum/social community for Jamaicans and lovers of Jamaicans residing all around the world where they exchange stories among other things. Jamaicans.com offers site visitors travel information personalized e-mail, discussion forums, social network, Jamaican restaurant directory, Alumni Directory, news and much more. The Heart Foundation of Jamaica is a non- profit, non- government organization founded by the Lion’s Club of Kingston in 1971. The objective of the Foundation is to reduce the incidence of death from heart disease in Jamaica by prevention through education, early detection through screening programmes, and rehabilitation through education about healthy lifestyles.